What makes the perfect chocolate cake? In our search for the perfect recipe for chocolate cake, we’ve beaten, whisked, baked and tasted until we were sick of chocolate. Okay, we were lying about that last part. But we did a LOT of baking tests to find our perfect chocolate cake recipe! Find out how to make it below. Try a brand like Valrhona or another good cooking chocolate (The Chocolate Society offers a good range online). You will need chocolate with a cocoa content of at least 60% for most recipes. We know what a good chocolate cake looks like, but what does the rest of the world think? It seems that almost every country has its own version of perfection. Each chocolate cake recipe is different – and each one is special. You could take a world tour eating chocolate cake alone – but you don’t have to. Because we’ve done the travelling for you. SACHERTORTE: the Austrian chocolate cake. If you’re visiting Vienna, a detour to the Hotel Sacher is essential. Their famous chocolate cakes are packaged in wooden boxes and branded with the hotel’s name, in case you were in any doubt of their origination. The Sachertorte is a dense chocolate cake sandwiched with apricot jam and finished with a hard-set, dark chocolate icing. It is a fairly dry, dense sponge but the combination of apricot and dark chocolate is sublime. Delia Smith provides a recipe for her own version of Sachertorte – the ‘original’ recipe is a closely-guarded secret – in her book, ‘Chocolate’. CHOCOLATE BROWNIE: the American chocolate cake. This rich chocolate cake is dense and fudgy; it’s very popular in Europe as well. 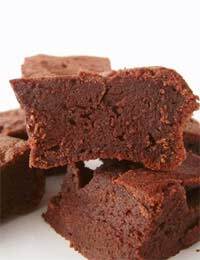 It is usually baked in a tray and cut into squares – this method allows cooks to minimise cooking time, so that the brownie comes out dense and sticky in the middle. It often features chocolate chips, walnuts or pecans, and can be made with white chocolate (Blondies). CHOCOLATE GATEAU: the French chocolate cake. This is an elegant creation that often towers over our traditional chocolate cakes! It is typically layered up with ganache or cream, and finished extravagantly – sometimes with rosettes of ganache, or a beautifully smooth dark glaze. TIRAMISU: the most famous Italian chocolate cake. Tiramisu is a luscious blend of chocolate, cream and coffee. It’s similar to British trifle in the way that Italian sponge fingers are soaked (in espresso), layered with cold mascarpone cream, and finished with an elegant dusting of good cocoa powder or chocolate curls. If you’re not concerned about corrupting the original recipe, look out for British versions featuring Tia Maria and Baileys! Sieve the first three ingredients into a bowl (or processor bowl), then add the margarine, caster sugar, beaten eggs, and milk, and beat until combined. Test with a skewer – when it comes out of the cake clean, the cake is done. Cool on a wire rack, and finish with chocolate buttercream or ganache. Fabulous recipe, sooooo easy and tastes delicious.